Jimmy arrived at Dudley Wood with a remarkable story behind him, and just shy of his 50th birthday. He had signed for Southampton when they opened in 1947 and spent several successful seasons with the club, eventually being named captain. He then became something of a nomad during the 50s and 60s with varying spells at Harringay, Poole, Ipswich, Plymouth, New Cross and finally Exeter, as well as a three year return to Southampton. At the height of his achievements, he captained Great Britain at Exeter against the Russians, and scored a maximum for the British side against an Overseas Select at Wolverhampton. Remarkably on October 4th 1965 Jim had already reached a milestone. That match at Exeter against Wolves was the date that Jim made his 500th league appearance! He joined Cradley in the winter of 1969, looking for a move to a Saturday track to ease his suffering work commitments. The Heathens had missed out on the best part of Jimmy's long and distinguished career but he still proved to a valuable asset by bringing some much-needed experience to the bottom end of the team. He eventually forged a memorable partnership with Roy Trigg and on form, the pair demonstrated a remarkable team-riding ability. Lasting memories of Jimmy Squibb in Cradley colours are likely to include a fantastic display in the 1971 Dudley-Wolves Trophy when he scored a total of 14 plus 6 bonus points and ensured the trophy came back to Cradley again that season. 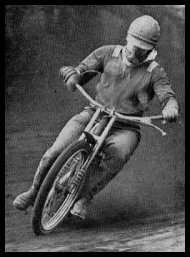 Theres also the occasion at Dudley Wood, when poor Jimmy had to pull up rather sharply on the last lap after the tractor driver had miscounted the laps and emerged onto the track with the riders in full throttle! In total, he spent the best part of three seasons at Cradley, before returning south and ending his career with Eastbourne, and finally Canterbury, before hanging up the leathers for good in 1975. Sadly Jimmy passed away in a Torquay nursing home aged 82 following a long illness. He was cremated at Torquay Crematorium on September 8th 2004. Web site created and maintained by Steve Johnson. E-mail me your comments and suggestions. Copyright: Steve Johnson & Cradley Heath Speedway Ltd, 2001.